Apr, 2009 – Over 300 million people all around the world are playing computer and video games. In the year 2009, computer and video games are expected to reach $35 billion in revenues. This makes eSports one of the most rapidly spreading phenomenons on the globe. 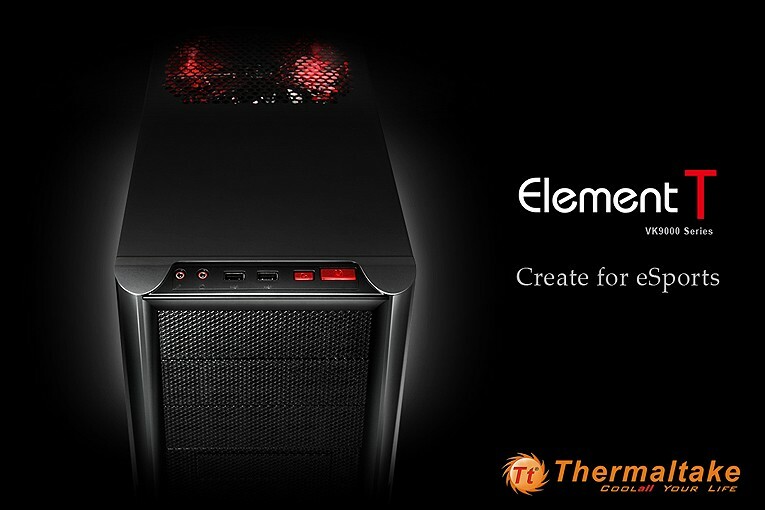 Thermaltake has foreseen this market demand and designed a chassis specifically for ever more popular eSports events. Designed by Thermaltake engineers, the sleek and athletic shape uses smooth forms and crisp surfaces to express a spirit of technology, speed and sophistication. Thermaltake products have always embodied a perfect balance between form and function and the Element T successfully continues this heritage. The design language of the interior reflects that of the exterior – simple, smooth surfaces and outstanding features all coming together in the chassis. –Tactical appearance for an optimized gaming experience. – Reserved fan openings for 120mm to 200mm at top and front panel, 120mm to 230mm at side panel. –Massive storage capability with 7 x 3.5” and 1 x 2.5 HDD or SSD bay. –Security lock for keyboard & mouse for lanparty events, etc. -Thumb screws for 3.5”, 5.25” and PCI devices for secure transportation. With the Element T accompanying you to your eSports events, you will be ready to perform as it provides highest reliability, giving you the focus of mind to win the games. Nächste Pressemitteilung Xpal-Kraftpaket für Notebook, iPhone und Co.